Joseph's Tiger and Bric-a-BracAnyone have charts for these..? I think Joseph composed Bric-a-Brac ...what about Joseph's Tiger? It was September 1994, and my dream had come true: I was gigging with a jazz violinist. 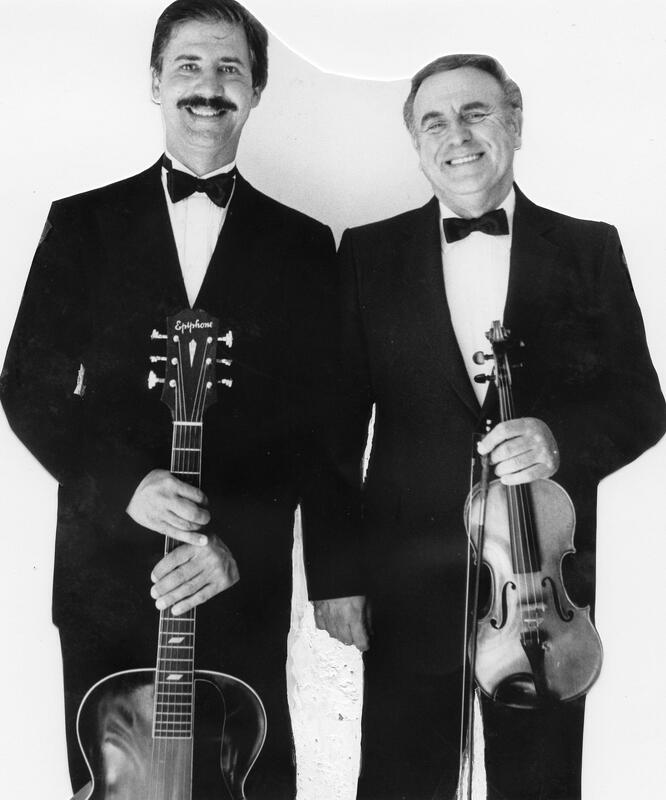 Our Niagara-based duo played pop tunes and jazz standards, but above all, the music of our heroes Eddie Lang, Joe Venuti, as well as Django Reinhardt and Stephane Grapelli. Best of all, there were even occasional gigs in which we would augment our duo with a jazz pianist and bass sax player and play the glorious music of the Venuti-Lang Blue Four! My violinist partner was an expat Scotsman named Bill Murphy, aka “Murph”. Born in Glasgow in 1930, Murph began his studies of classical violin at an early age, but his world was forever changed once he heard Stephane Grappelli play on BBC radio, and he devoted most of his life to playing that style of music, first mastering that light-as-a-souffle Grappelli sound and then later the more volcanic stylings of Joe Venuti… and of course, other favourites such as Stuff Smith and Eddie South along the way. Bill was not only a musical force to be reckoned with, but also one of those proverbial “well-balanced Scotsmen--- with an equal chip on each shoulder”. Sadly, after doing a couple of cruise ship gigs which involved intense 24-hour togetherness, Murph and I parted ways in the late nineties. We had very little contact for the rest of his life, until his passing on July 20, 2017 at age 87. But going back to 1994: my daughter Olivia was in high school, and she befriended a girl who was newly arrived from Philadelphia. On one of my trips to pick up Olivia from her friend’s house, I got talking to her parents, and mentioned that Philadelphia held a special place in my heart because two of my jazz heroes had grown up there. Unsurprisingly, they had never heard of Venuti or Lang. But surprisingly, a few months later, they called me to say that they had been visiting Philly and happened to see an article in the weekend Inquirer which they had saved for me. The article was all about Eddie Lang and featured quotations from his two surviving relatives who still lived in the Philadelphia area: Lang’s nephews Tom and Eddie Massaro, who were sons of Lang’s older brother Tom Massaro. It only took one call to “information” to find a phone number for the Massaro brothers and arrange a visit to South Philly for a guided tour of all of Eddie and Joe’s old stomping grounds. Flash forward to March 2018: Murph’s widow calls me up unexpectedly to tell me that in going through all his old belongings, she came across a bunch of old photos, and perhaps I might want them? It turned out that among the stuff was the photo record of our Pilgrimage to Philadelphia, which I had thought to have been long lost over the years, was found! So now I am going to share it with you, and hopefully, with posterity. The internet was made for this! Murph and I were well aware that our September, 1994, pilgrimage to Philadelphia would be the trip of a lifetime, so we made sure we had a couple of cameras that worked and we also rented a video recorder. Unfortunately, the video recorder’s battery failed almost immediately, so we had to abandon it in the trunk of our car. But we did manage to get some fairly good snapshots during the tour, which will be seen in the postings below. We also wrote copious notes on each photo, including the addresses of all the sites we visited, and these will also be included for fellow Venuti-Lang fans who may want to make their own pilgrimages. PS I haven’t made any effort to find out if Tom and Eddie Massaro are still alive. If anybody in the Philadelphia area has any good news about that, it would be great if they could share it. Below: Murph and me, sometime in the 1990's. 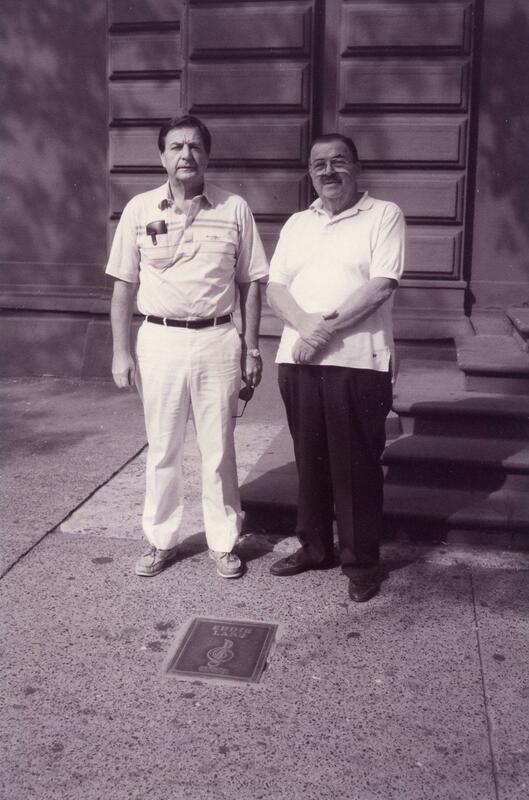 We first met Lang’s nephews Tom and Eddie (left) Massaro at Eddie Lang’s memorial plaque on Philadephia’s “Walk of Fame” on South Broad Street. They are the sons of Alexander “Tom” Massaro, Lang’s older brother. Lang himself unfortunately died childless in 1933, age 31. According to the Massaros, Venuti unfortunately had no living relatives left to lobby for his well-deserved inclusion on the “Walk of Fame” as one of his city’s legendary musicians. 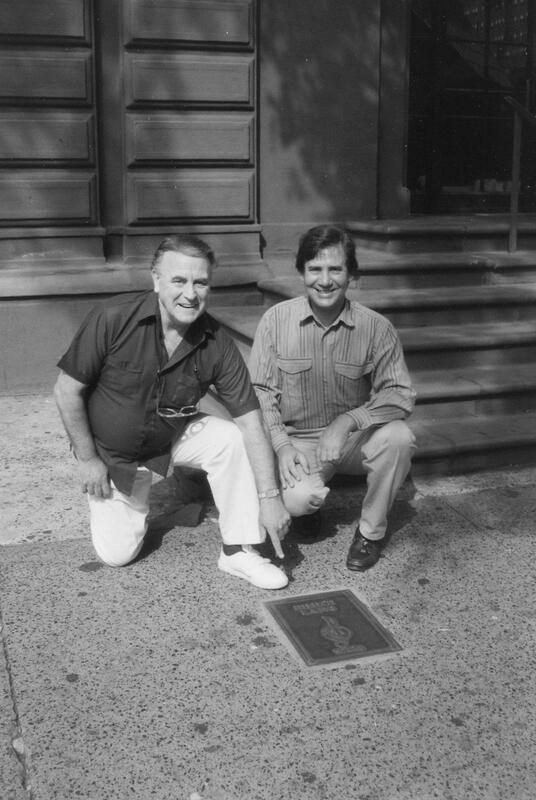 Will Wilson and Bill Murphy (left) with Lang’s memorial plaque on Philadephia’s “Walk of Fame” on South Broad Street. The building behind us is the Academy of Music, home of the Philadelphia Symphony Orchestra. According to the Massaro brothers, Venuti was offered a steady gig with the symphony in the 1920’s, but turned it down because he was making so much money as a freelancer. But presumably, Venuti must have played in this hall at least once during his brief career as a symphony musician…? 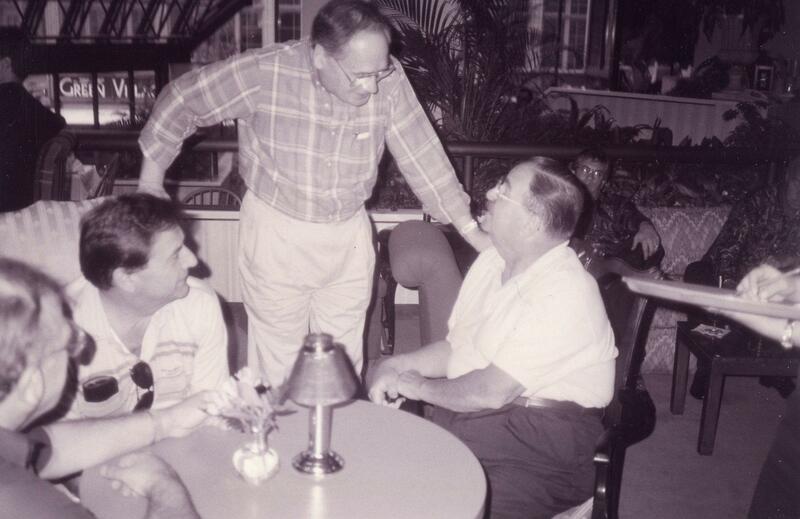 The Massaro brothers seemed to be quite well known in Philadelphia, because during our day with Eddie and Tom, they were approached twice by complete strangers supporting their campaign to keep Eddie Lang’s memory alive. 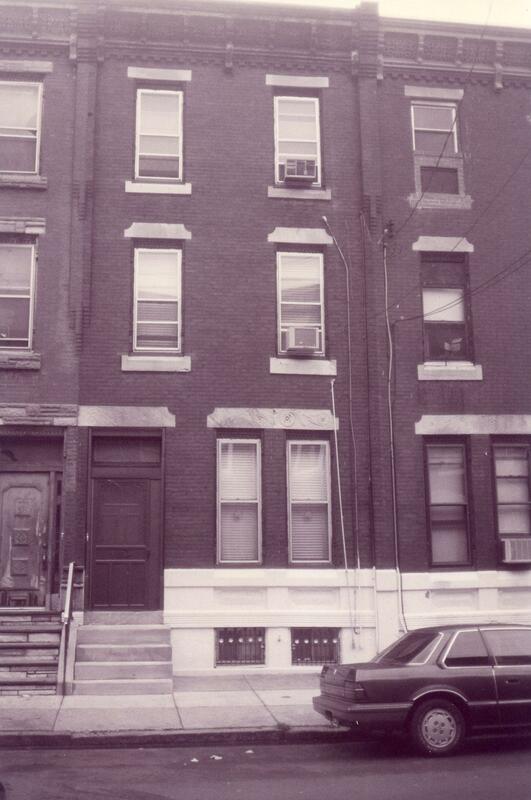 Photo four: Eddie Lang’s boyhood home, 738 St. Albans St.
St. Albans St. is roughly ten or twelve feet wide, and the house can’t be much more than fifteen or sixteen feet wide. It obviously would have been very crowded for a large family like the Massaros. Eddie/ Salvatore was the youngest child in the family. He had one older brother, Alexander, better known as “Tom”, who played a bit of guitar as well, and who occasionally even subbed for Eddie! Eddie’s other siblings were sisters who were much older. Unfortunately, I don’t know any of their names. Salvatore/Eddie was not born in this house, but in another one in the same neighbourhood, 701 Marshall St. 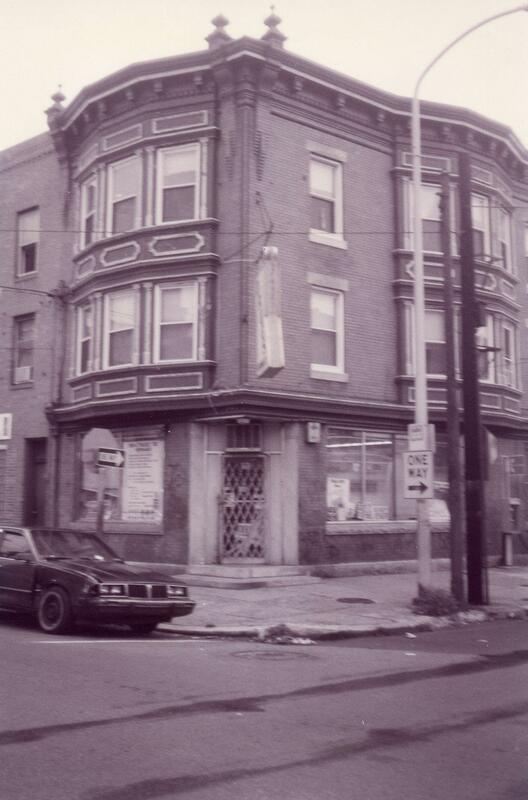 Unfortunately, the original building is now gone and a small apartment building now stands at the site, 701-715 Marshall St. This photo, and some of the others are in colour... probably because Murph took them with his camera. 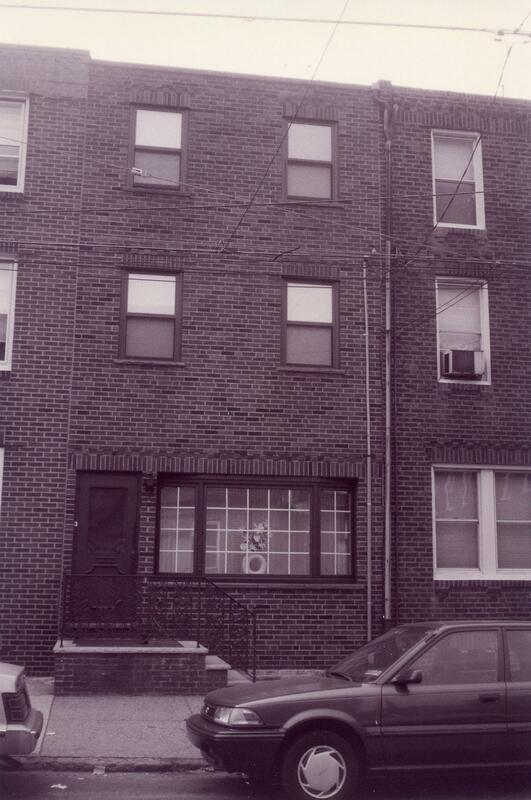 Joe Venuti’s birthplace, 1010 Christian St., a few blocks away from Lang’s. 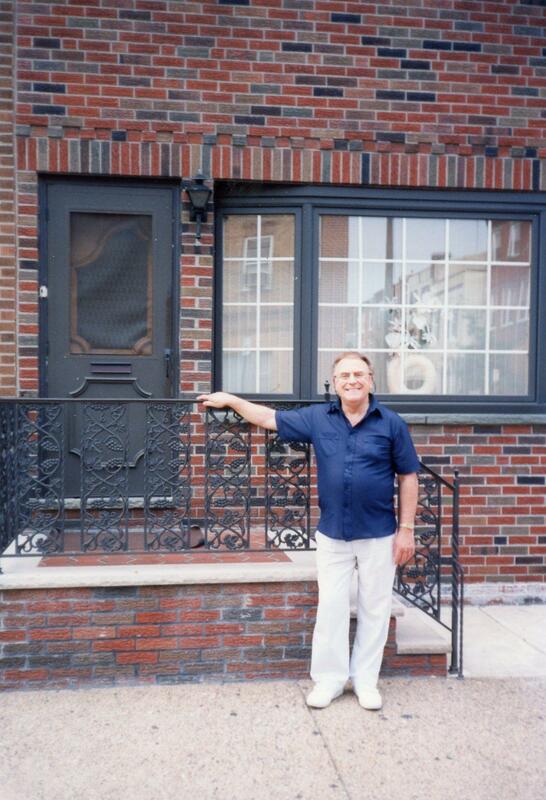 The late Bill Murphy, my former musical partner, outside Joe Venuti’s birthplace, 1010 Christian St.
Lang’s older brother Tom kept a scrapbook of Lang’s gigs and reviews, which was passed down to his sons Tom and Eddie when he died. In the scrapbook were a number of newspaper columns written by syndicated entertainment columnist Ed Sullivan (!) , who turned out to be a huge Venuti-Lang fan and was happy to help publicize their gigs whever they played in New York City. In one of Sullivan’s columns, it was mentioned that Joe Venuti’s father was a barber who had had a shop at the corner of Eighth and Christian. We visited that intersection and took photos of all four corners. Of course, there is no way of knowing which corner would’ve housed the Venuti Sr. barber shop. But since the most charming and best-preserved building was the one pictured below, let’s just pretend that it was the correct one…? History does not record exactly when Venuti met Lang. A sad omission! Boo, history! Perhaps it was at their neighbourhood Catholic church? Or outside playing on the streets of South Philadelphia? But it is definitely known that both boys attended and played in the school band of James Campbell Public School, which was at the corner of Eighth and Fitzwater, and that Lang was an enthusiastic fan of Venuti’s playing even as a boy. Surviving photos of the school show a massive warehouse-y looking place about six stories tall. 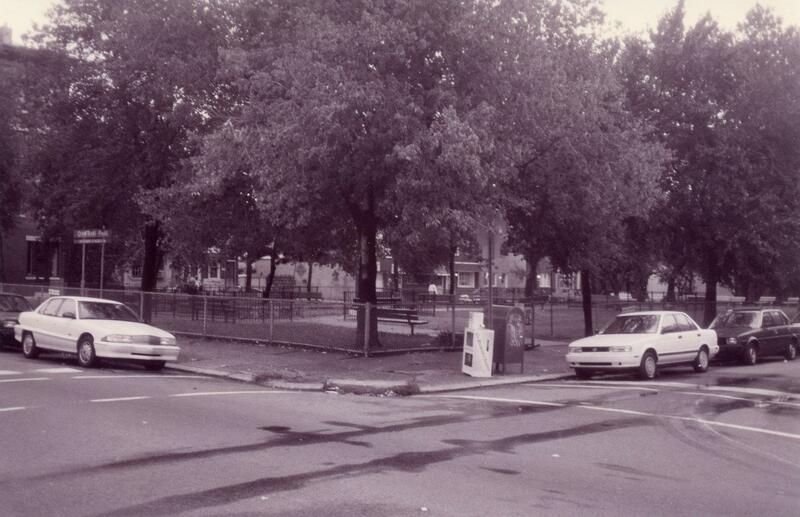 But the building was eventually torn down to make way for pleasant, tree-lined Cianfrani Park. I don’t think Lang would’ve have been too upset about this. 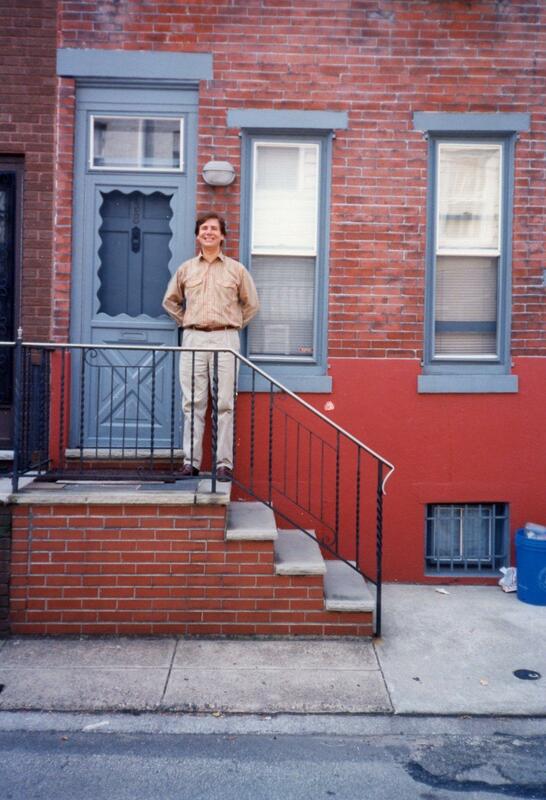 In the mid-to-late 1920’s, Lang’s brother Tom, Tom's wife Maria, and his father Domenico, who had been a widower since 1923, moved to a new dwelling at 1629 Fifteenth St.
By this time, Eddie was living in New York City, but he and his wife Kitty would stay at this house whenever visiting Philadelphia. Kitty was a chorus girl when Eddie first met her and showed her a few chords on her new ukulele. It turned out that Kitty got along famously with the wife of Eddie’s new musical partner Bing Crosby, Dixie, who had a similar showbiz background. 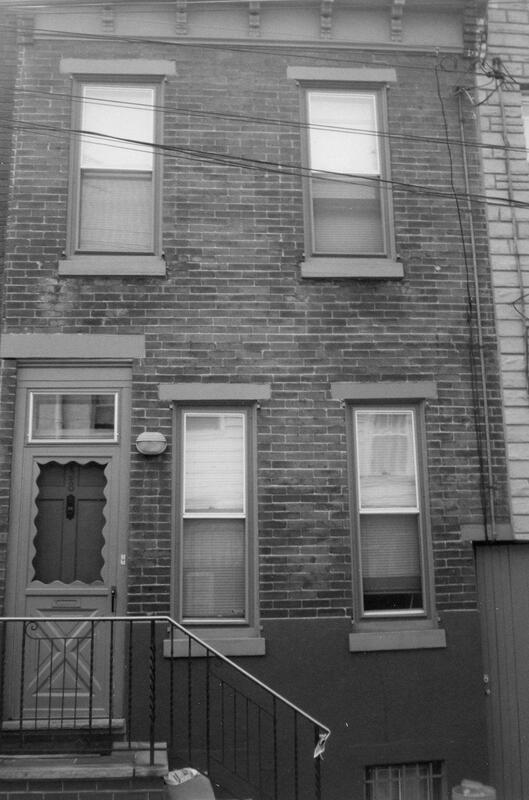 Anyway, whenever visiting Philadelphia, Kitty and Dixie enjoyed sitting out on the front steps of this house, basking in their celebrity and chatting with passersby. Massaro family legend has it that Dixie was greatly impressed by the fact that Phildelphia’s garbage collection service continued until midnight. Sadly, the entire street in front of this house was filled wall-to-wall with mourners upon Lang’s unfortunate passing and funeral in 1933.